"...For each chemical, the chemical manufacturer or importer shall determine the hazard classes, and where appropriate, the category of each class that apply to the chemical being classified...Chemical manufacturers, importers or employers classifying chemicals shall identify and consider the full range of available scientific literature and other evidence concerning the potential hazards. There is no requirement to test the chemical to determine how to classify its hazards. Appendix A to §1910.1200 shall be consulted for classification of health hazards, and Appendix B to §1910.1200 shall be consulted for the classification of physical hazards. Note: Under the now-obsolete 1994 version of the standard, this process was far less rigorous and called hazard determination. Hazard classifications replaced hazard determinations with the issuance of the current (2012) version of the standard. Classification lists the specific Classes of hazards, for example carcinogenicity or flammable solid. Within the Hazard Classes the degree of hazard is indicated with a Category. The Category is usually a number (1-4) or letter (A, B, C) although there are few that are indicated with words. 1 indicates a greater hazard category than 2, and A is a greater hazard than B. Some of the numeric categories have subcategories, so Class 2A is more hazardous than Class 2B, for example. For gases and some reproductive toxins, the categories are listed by names rather than numbers or letters. This ranking system where 1 = the greatest hazard and 4 = the least is the exact opposite of the NFPA and HMIS® systems, and is a serious potential point of confusion for untrained workers. Further, as can be seen in the next section, not all hazard classes have entries 1-4; some have only category 1, some have 1-2, 1-3 or 1-4, and Explosives is broken into 6 divisions! Editorial aside: We have no idea how a respected agency like the UN could come up with such a muddled and inconsistent ranking system. Seriously, couldn't they have labeled everything with names - why not Highest, Severe, Moderate, and Low so people wouldn't have to deal with figuring out what numbers and letters mean? How hard would that have been? Determination of whether the chemical will be classified as hazardous and the degree of hazard. Appendix F to §1910.1200 provides specific further guidance for the carinogenicity assignment. Test data can be used if it is available, but no testing is required. Bridging principles can be used to estimate the degree of hazard based on the hazards of the mixture components. If all else fails, there are technical methods to estimate the hazard classification. Of course, there are other required elements for the SDS and label. And the information contained in the SDS and label will be part of the training required for those employees who use or could be exposed to the material. Classification is performed by the author of the sheet; there is no need for employers to perform an hazard classification of their own unless they are the manufacturer of the material. If you are a downstream user of the sheet, you are allowed to rely on the classification on the materials that you received. Given that the complexity of the hazard classifications that must be communicated to your employees, a poster as well as training that explain the meanings of the various pictograms and such is a very good idea. Classification and Labelling Summary Tables for the GHS at UNECE. WHMIS 2015 - Hazard Classes and Categories at the Canadian Centre for Occupational Health & Safety. GHS - OSHA HCS Comparison; Comparison of Hazard Communication Requirements at US OSHA. 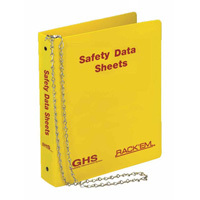 GHS Hazardous Chemical Information List at Safe Work Australia contains a list of chemicals and their classifications.